The heatlhcare sector has been the leadership group over the last five years in all geographies of the MSCI World Index. The most well known industries within the healthcare sector are the biotech and pharmaceutical industry. Given the performance of the healthcare sector, many are cautious that valuations have gotten extended and the five year bull run may be over. While this may be true of the biotech industry, we think the pharmaceutical industry still offers tremendous value. In the table below, we capture the average intangible adjusted price to cash flow ratio for each sub-industry in the healthcare sector. In our intangible-adjusted valuations we capitalize R&D, advertising and all other intangible capital investments. While biotech is the second most expensive sub-industry at 22.2x cash flow, pharmaceuticals are the second least expensive at 9.9x cash flow. When we dig into individual names, we can also see the current multiples of US pharmaceutical companies are far from the extremes that they experienced in the deflationary boom of the 1990s. Let’s start with a look at the last 14 years of annual intangible price to cash flow data. The latest sub-industry average is 13.6x cash flow, which is surely higher than recent experience when multiples were single digits. If we look back a little further in time, we can see that these stocks fetched much higher multiples in the late 1990s. 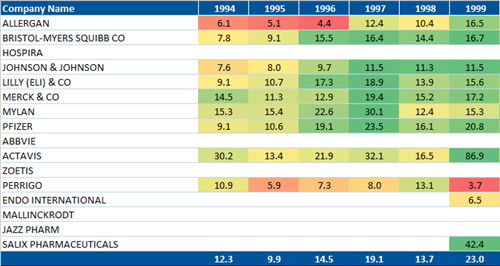 Here we look at 1994-1999 and see that the industry average multiple was 23x cash flow and most names were 15-20x cash flow. In particular companies like Eli Lilly, Johnson & Johnson, Merck, Bristol Myers and Pfizer all currently sell for a 50-65% discount to 1999 valuations. Many pharma companies still sell for reasonable multiples, especially considering low long rates and the fact that pharma companies are long duration assets.